It’s a party. It’s a concert. 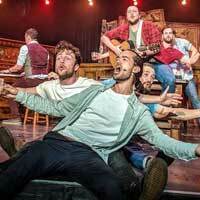 It’s a pint-filled good time set in a working pub that combines hair-raising harmonies, high-energy dance and live percussion with foot-stomping choreography. The runaway hit of numerous international music festivals is hitting the road for its first U.S. tour, offering up 90 minutes of indisputable joy. Be there when the multi-talented cast of nine handsome blokes sings everything — pub tunes, folk, Broadway, classic rock — all to roof-raising heights. It’s the best singing, dancing, stomping pub crawl of a concert you’ll ever attend, and now you can enjoy it at the La Mirada Theatre for the Performing Arts.